One of the most vivid memories I have of visiting Greece as a teenager is the amazing food. Everything tasted wonderful and different from foods that I was used to at that time. I loved the pastries, the meats and the delicate flavors. 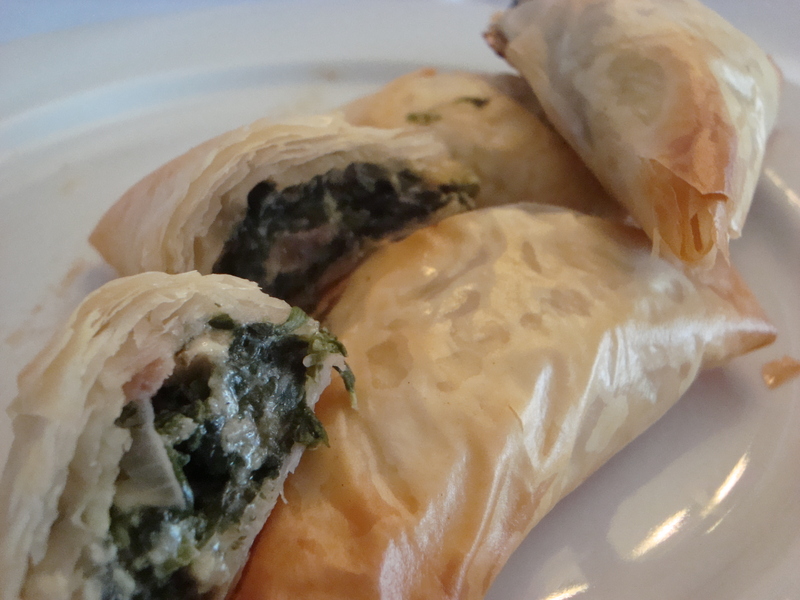 It’s during that trip that I began a serious love affair with Spanakopita, a crispy, delicate and delicious Spinach Pie. I seriously could eat huge quantities of Spanakopita. Every year in September, my city has a big Greek Festival. I try to go annually to load up on Greek delicacies that I don’t have time to make. For years I used to pig out on Spanakopita at the festival, when finally a few years ago I got smart. 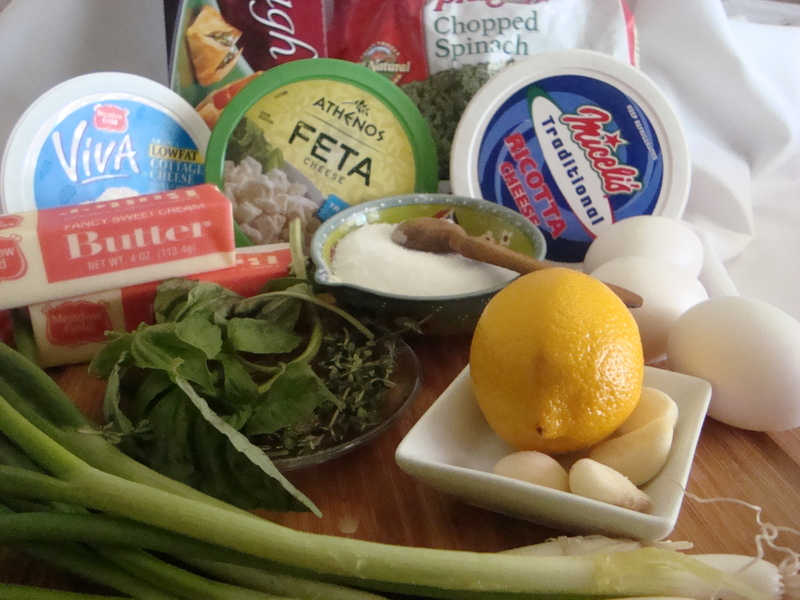 I decided that I’d asked all of my Greek friends to give me their very best versions of Spanakopita recipes so I could try them all. My friends were very helpful and passed on several recipes and over the last several years I’ve combined the things I liked from all of them to come up with this current recipe. 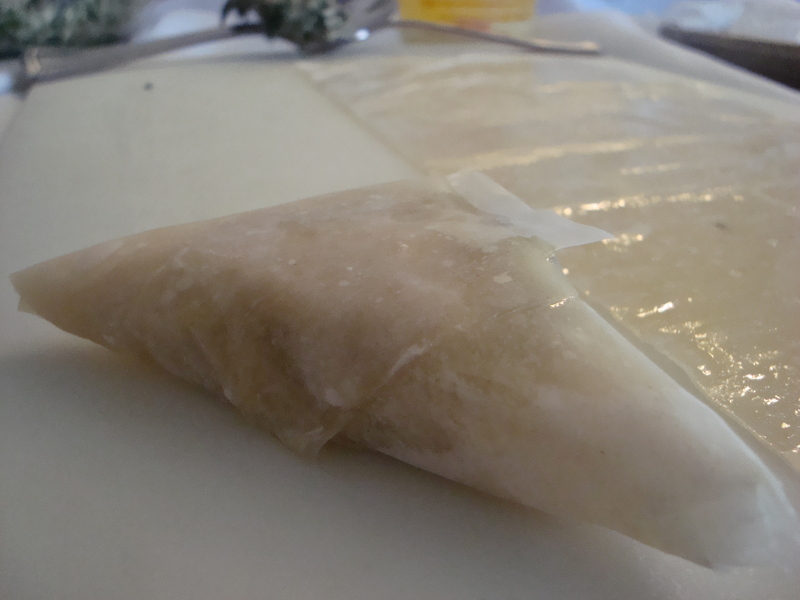 Some families like to make Spanakopita in a large pan and cut them into squares, while others prefer to make them into triangle shapes. I love the versatility of the triangle shape since it’s so portable and because I can freeze them and bake them up individually (or a whole bunch) whenever I have a craving! 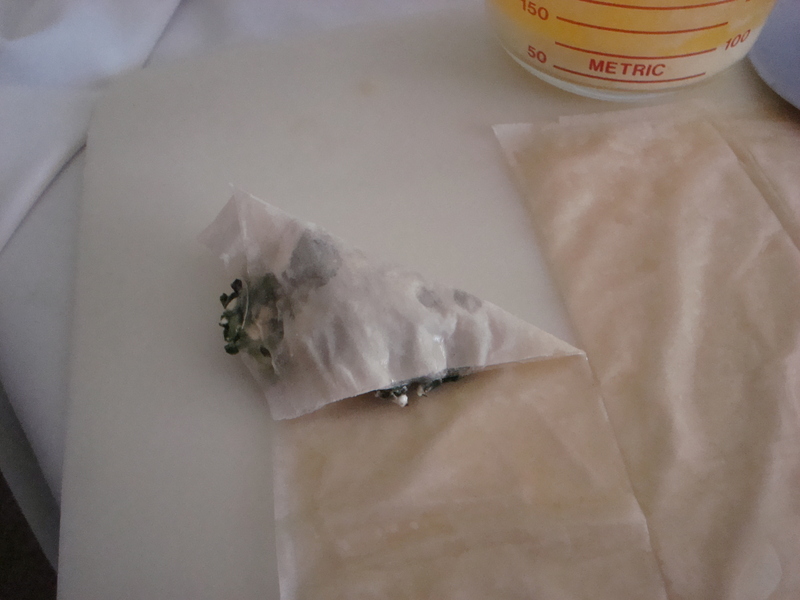 Defrost Spinach and squeeze out all excess water and set aside. 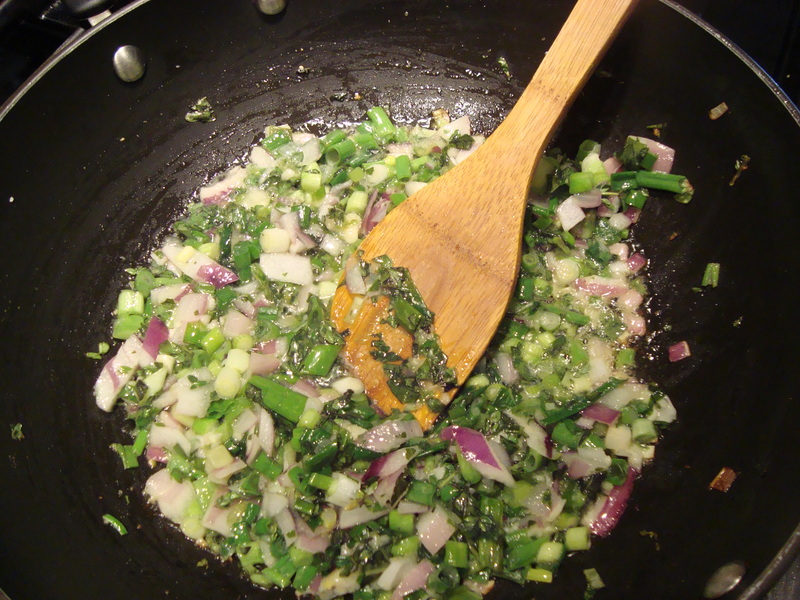 In a large skillet heat olive oil and saute onions, scallions, garlic, salt and herbs. 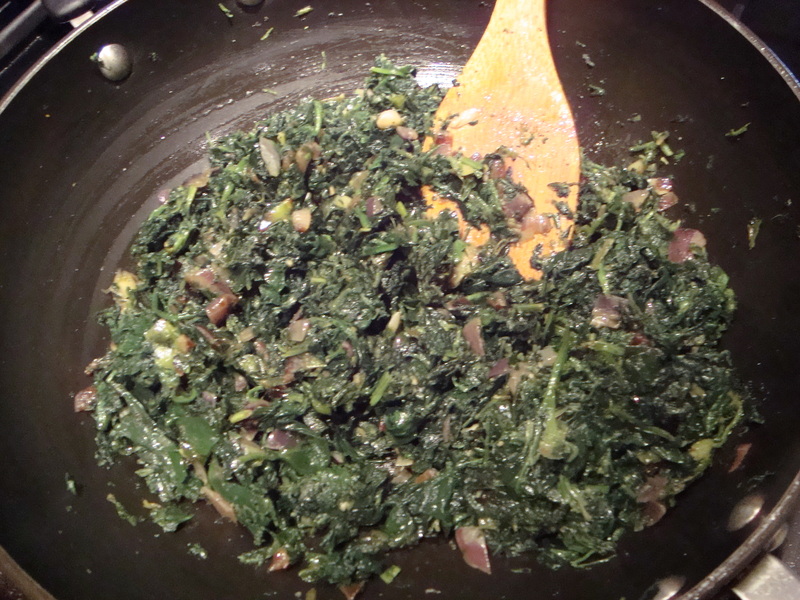 After onions are tender, add Spinach to the mixture and stir fry for a few minutes. Take off heat and pour it into a large bowl. 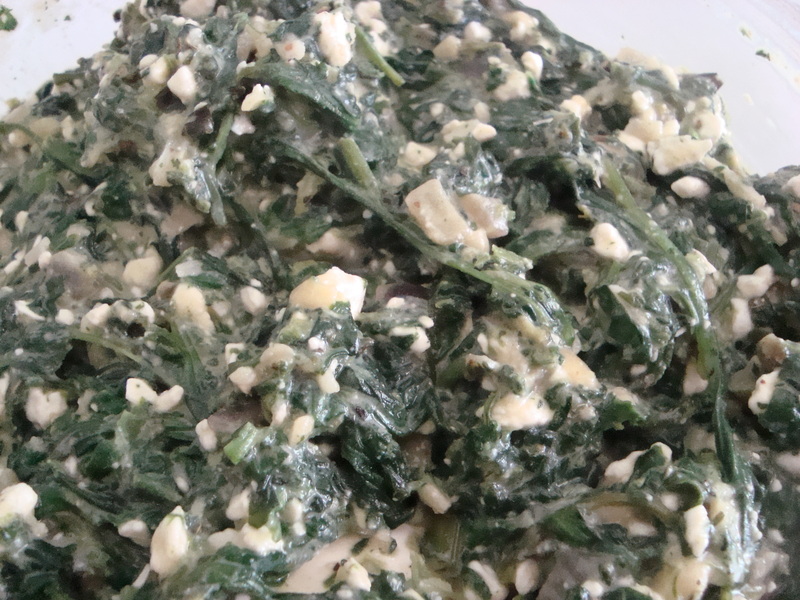 Add eggs, cheeses and lemon juice to the Spinach mixture. Stir to mix well. 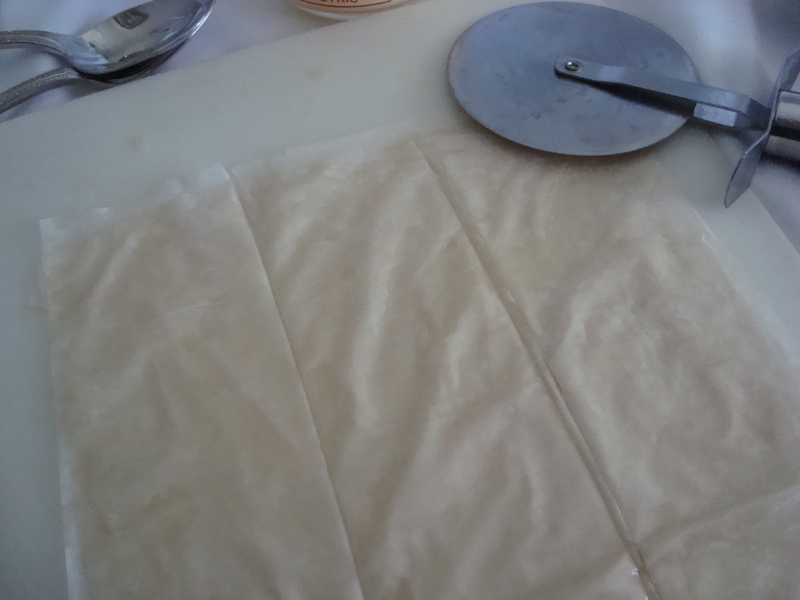 Take out Fillo dough from package and put them on a cookie sheet and cover with a damp paper towel so they don’t dry out. Melt 3 sticks of butter in a microwave safe bowl and get a pastry brush. 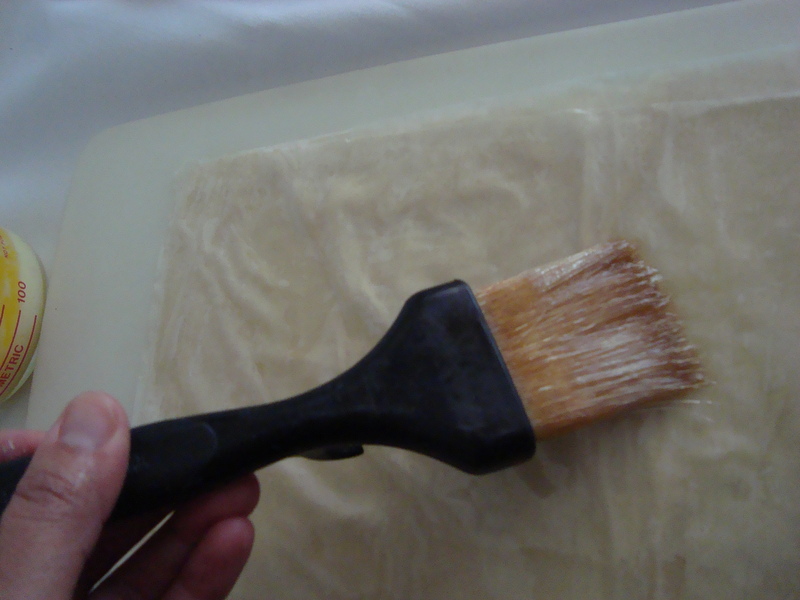 Place a piece of Fillo dough on a large cutting board and brush it with melted butter, working quickly so the fillo doesn’t dry out, place another sheet on top and brush that with butter as well. Repeat with three sheets of Fillo. Using a pizza cutter, cut three equal long strips on the Fillo. 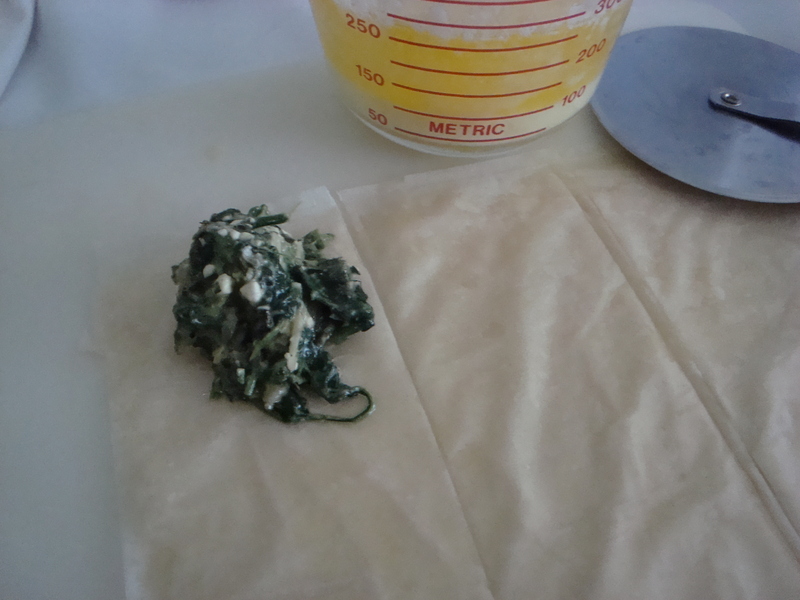 Place a large 1 1/2 tablespoon of spinach filling on the top of one of the strips and fold it at an angle so it forms a triangle. 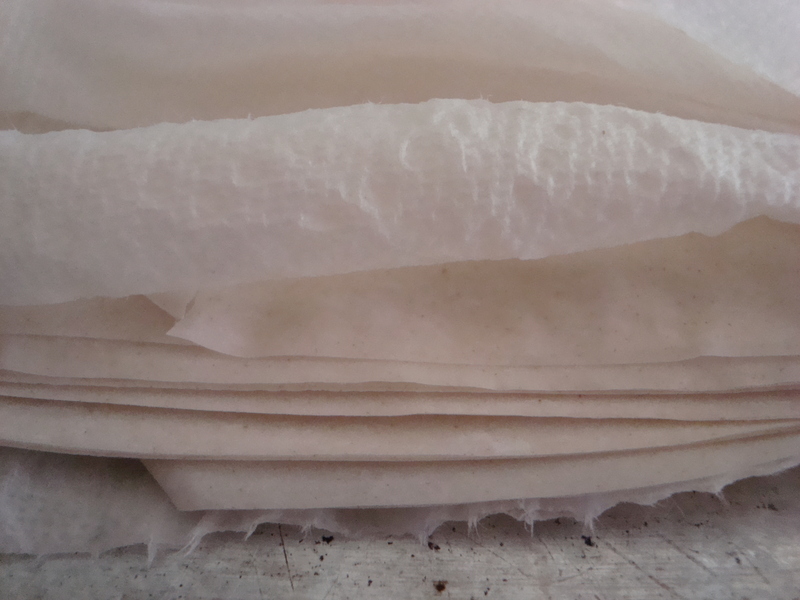 Keep folding the triangle onto itself until all the filling is enclosed in a triangular shape. Place it on a cookie sheet and brush the completed triangle with melted butter. Repeat the procedure withe the other two strips. 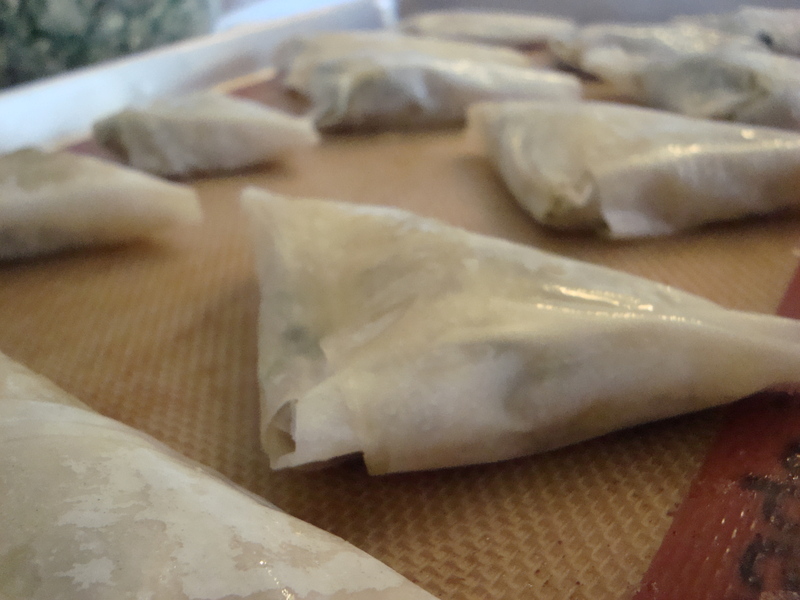 Continue making triangles with three sheets of buttered Fillo at a time. Should yield about 42-46 individual Spanakopitas. Bake at 400 degrees for 12 minutes. Serve warm.